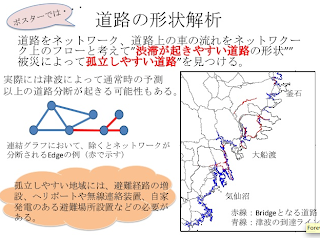 "Visualization of the Evacuation Process During the Tsunami" project by "Team Masters & Forever 22" started from a simple question- Why were evacuation during the tsunami so slow? In order to get hints to save lives in future disasters, they analyzed how people moved fleeing from tsunami in the coastal areas. They used ZENRIN Datacom's data to see the changes in population density per 250m2 and visualized them on Google Maps, in conjunction with shelter data and water level data. 4) the researcher had 3 relative families there, and one is still missing due to tsunami, so she has talked with the citizens and knows the actual situation there before and after the tsunami. This is the map of Otsuchi, red line shows where the tsunami came. 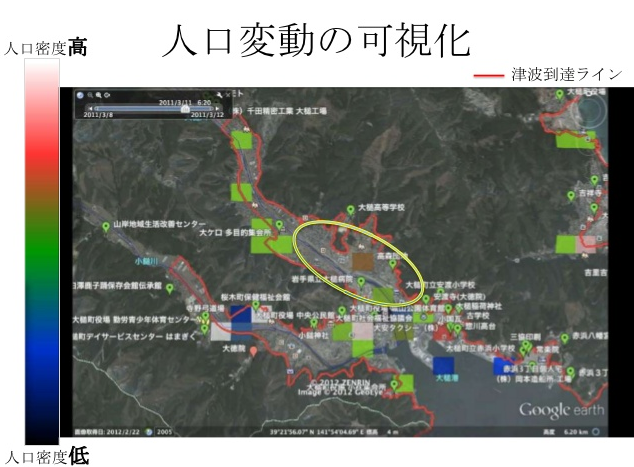 The area circled with yellow line is the area that are the busy area during the daytime, with municipal buildings, hospitals etc, and note these are all built alongside the river. The team mapped hourly population density change and created video out of those data. The earthquake happened at 2:46 p.m. 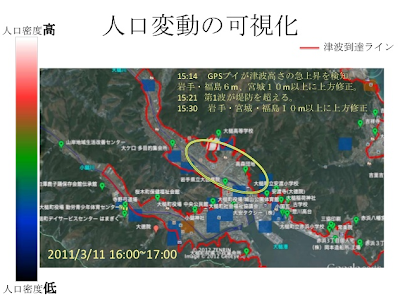 The Meteorological Agency issued an urgent report that the tsunami is estimated at 3m in Iwate. The levees in Otsuchi are 6.4m tall, so many people figured that they wouldn't have to evacuate, and there even were people who took cameras to the top of the levees to watch the ocean. 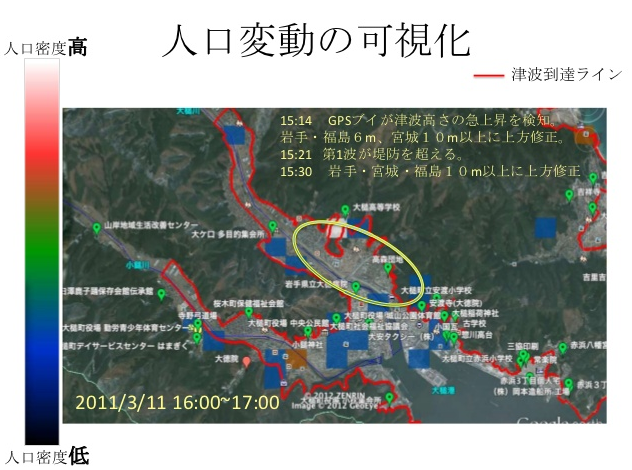 30 minutes after the quake, the Meteorological Agency issued its first correction of the initial estimate of tsunami size, but at this point the first wave of tsunami had already reached the town. At Otsuchi, in merely 30 minutes, the waves surmounted the levees and entered the town, influencing citizens' destiny. This picture is from around 4 p.m. Most people have already evacuated from the coast. Since Otsuchi is a small town, it may seem that everyone should be able to reach higher and safer places within 10 minutes. 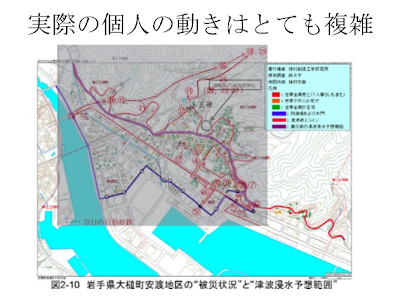 However, as you can see from this data- which is the route an actual tsunami victim took to evacuate, movement of people are much more complicated. She says it would be useful for preventing similar disaster in the future, if we could get a more detailed data of the movements of people in these decisive 30 minutes. After the tsunami's arrival people do not move much, but can see a slow decrease of people. 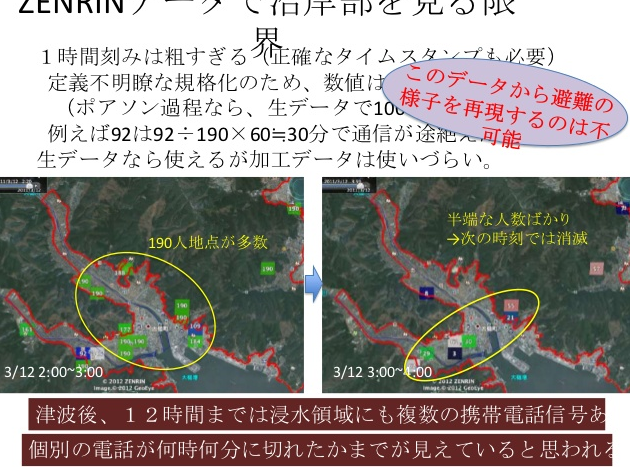 Since Zenrin's data is based on the GPS information of cell phones, and there were power outages in the town, it is likely that cell phones ran out of battery and lost their GPS connection. Also, there are issues about the data. 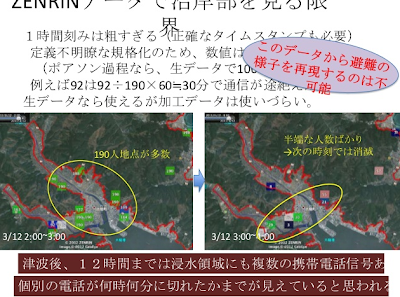 The image on left shows population distribution from 2 to 3 a.m. on the day after the quake, and on the right, from 3 to 4 a.m.
Zenrin's data had 190 people in several places in the image on the left, and those people disappeared in the image on the right. Also, we see numbers like 92. This number probably comes from the calculation of 29 minute long access, by multiplying 29/60 by 190.... representing the proportion of people with reception over time. In larger cities, those calculations might be effective, but in smaller towns like Otsuchi, we should use raw data to get accurate movement of people. However, we are able to learn two important things from this data. So we can propose several useful ways of using cell phones during disaster from this data. information like that to firefighters or the Self-Defense Force or relatives, it would help the search effort. This would enable us to send evacuation and rescue information via e-mail to people in need. In order to make those work, we would have to have exception to privacy protection law to rescue disaster victims. The thing about 30 minutes is interesting. The standard life for cell phone relay station batteries is 30 minutes, too, so there might be connection. They will be changing the battery life of relay stations to 24 hours, so that might affect it. Un reality, the cell phone batteries held up. But even in cases where there were generators and cell phone batteries available, sometimes the relay station had been swept away or the power of relay stations went down. Supposedly the cell phone relay station batteries lasted for about 24 hours. After that, probably also due to congestion, communication became impossible. Cell phone's power saving more is important, but ways to prolong relay stations are even more important. This team also presented at the poster session with their analysis of tendency of roads that tends to get traffic congestion and roads that tends to isolate victims by natural disaster.